“What You Should Know About Baptism” from Christian Faith Publishing author N.J. Dillinger is a profound read discussing arguments and aspects relating to baptism’s biblical connotations. “What You Should Know About Baptism”: an illuminating narrative that presents the knowledge behind getting baptized for one’s faith and conviction. “What You Should Know About Baptism” is the creation of published author, N. J. Dillinger, an evangelist who conducts Bible studies and brings souls to Christ. Published by Christian Faith Publishing, N. J. Dillinger’s new book uses the Bible as the most comprehensive reference to properly define what baptism truly means for one’s faith as a believer in God. With the multitude of Judeo-Christian beliefs and practices, many arguments surround baptism. This book explains the purpose of baptism and why it is so important to one’s identity as a follower and child of God. View a synopsis of “What You Should Know About Baptism” on YouTube. Consumers can purchase “What You Should Know About Baptism” at traditional brick & mortar bookstores, or online at Amazon.com, Apple iTunes store, or Barnes and Noble. 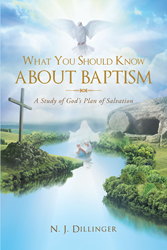 For additional information or inquiries about “What You Should Know About Baptism”, contact the Christian Faith Publishing media department at 866-554-0919.